I'll be honest with you; I don't understand Dito Montiel. If you don't know him, he's the writer/director behind the war drama Man Down. But he's also a director whose career took off right alongside Shia LaBeouf and Channing Tatum. His first and best film, A Guide to Recognizing Your Saints, starred the duo in a story that was about Montiel himself. Since then, Montiel has worked with loads of great actors, but his filmography reads like a cinematic wasteland: Fighting, The Son of No One, Boulevard (Robin Williams' final screen performance, sadly), and Empire State (which went straight-to-VOD despite Dwayne Johnson and Liam Hemsworth in it) are all pretty bad-to-atrocious. And unfortunately, Man Down, which reunites Montiel with LaBeouf, can be filed away as another curious blemish on the filmmaker's resume. 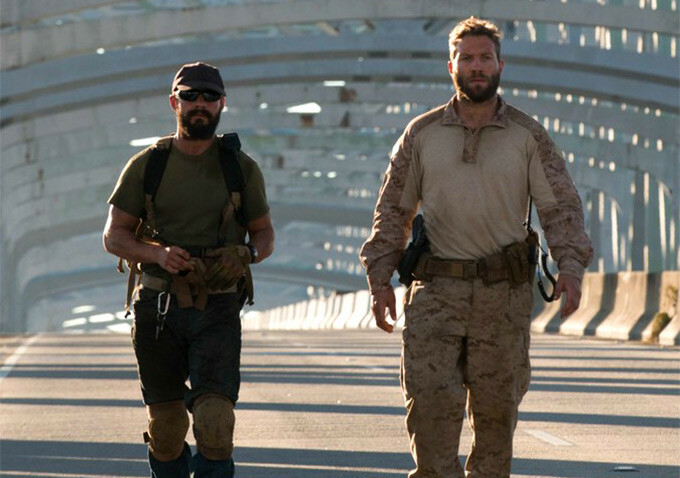 The biggest problem appears to be that Montiel and LaBeouf are making two totally different movies. Montiel seems to think he's got a post-apocalyptic Red Dawn remake on his hands, with scores of grimy, muddy soldiers fighting enemies on bombed-out native turf. LaBeouf is engaged in a serious character piece about a soldier returned home from Afghanistan with PTSD and his struggles to reconnect with the wife (Kate Mara) and son he left behind. Never shall the two opposing approaches meet, or at least not in any satisfying way. 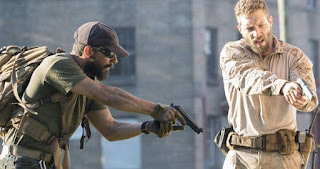 The film begins in action-flick style as Gabe (LaBeouf), geared up and ready for combat, barges into a rundown building to rescue his captive son, Jonathan (Charlie Shotwell). Who kidnapped him and why? Who are the enemies that have waged war on American soil? That much is kept in secret, but the signs of a nation in crisis are everywhere and suggest some kind of invading force. It's easy to make fun of LaBeouf for the dumb stuff he does away from the screen, but he's still an extremely talented actor. His performance in Man Down actually holds up well as part of a recent string of solid turns in American Honey and Nymphomaniac. He's actually quite engaging in the early going as we see Gabe in his home life, sharing a few precious moments with the family before shipping out. 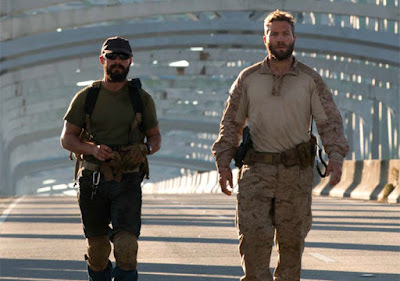 We also see Gabe get some bro time with his pal Devin (Jai Courtney), who is the one who convinces him to join the Marines, although he might have anyway after filling his head with the paranoid rantings of Fox News' Bill O'Reilly. A touching moment gives us our reason for the movie's title, as Gabe and Jonthan use "man down" as a manly term of affection to spare the boy from embarrassment at school. These scenes at least do a workmanlike job of setting up Gabe's future emotional torment, which is more than be said for an unnecessary boot camp montage that could have been cribbed from any of a million military dramas. Shouting sergent (Tory Kittles), crawling around in mud, more shouting, rope climbs, "Sir yes sir! ", etc. etc. Most of this is seen in flashback during another plot thread as Gabe is questioned by a military superior (Gary Oldman) looking to get to the bottom of a deadly incident that occurred in the middle of a firefight. The quiet back-and-forth between them is the doorway into learning of Gabe's emotional burden, and makes a subtle statement on our treatment of soldiers returned from the war in need of serious psychological attention. These exchanges also set up the movie's framework and the multiple mysteries at play, when in reality there probably only needed to be one. 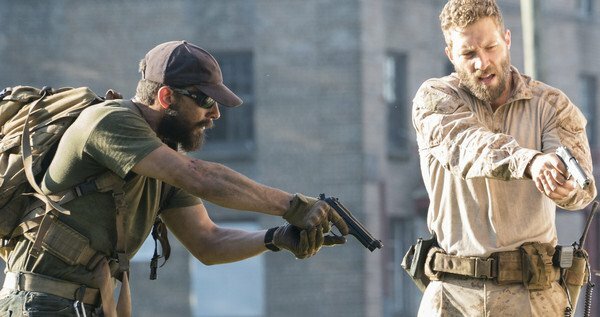 For the story of a PTSD-afflicted soldier is already compelling enough based on what Labeouf gives us. But he is quickly mired in a mish-mash of stale family drama, battlefield action that show's Montiel's lack of a budget, and eventually a psychological thriller with a twist telegraphed from a mile away. Rather than serving to bolster one another all of these individual elements cannibalize from the next, leaving little to Man Down worth savoring other than LaBeouf's committed portrayal. By the time the overly manipulative conclusion come around you will have forgotten that Jonathan was ever kidnapped and sure as Hell won't care if he's found. Throughout his career it's fair to say some of LaBeouf's best work has been with Montiel, but the director just can't live up to his end of the bargain.